In the 1980s, New Zealand embarked in a zealous plan to deregulate anything and everything. 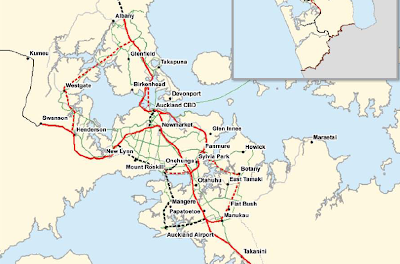 New Zealand's rail network became a victim of privatization in 1993. The rail system entered a 10 year period of "deferred maintenance" with the private corporation running the system into the ground. See the lack of investment in rail, New Zealand's central government bought back the rail network infrastructure in 2004 and in 2008 basically re-nationalized rail under the name KiwiRail. This is important to note because Auckland's public transit rail network infrastructure is owned and maintained by KiwiRail. The suite of projects will be completed by 2013. 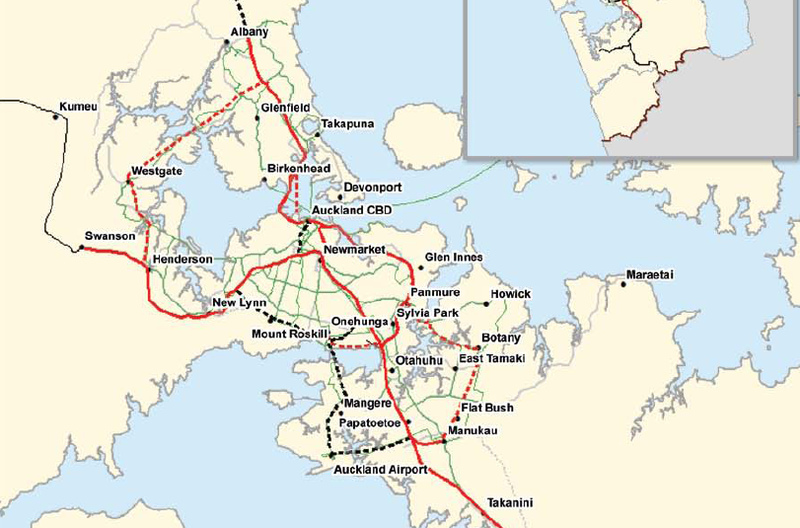 The next major rail project is a 3 kilometre double tracked rail tunnel in Auckland's Central Business District which is estimated to cost between $1.99b and $2.38b and proposed to open in 2021. Auckland has certainly embraced rail as an essential part of growing transit usage in the region and it is already starting to pay off. Almost five million extra journeys were made on public transport during the last calendar year, with big increases in passengers pushing numbers to the highs of the 1950s. Auckland Transport released a patronage report today that shows total passenger numbers reached 64.07 million in the 12 months to the end of February, an increase of 8.3 per cent on last year. Rail patronage reached 9.2 million for the past 12 months with passenger numbers for the month of February up 17.9 per cent on February 2010. For the first time one million journeys were reached on rail in one month. Rail patronage on the Western Line for the month of February increased 25.6 per cent on February 2010 to reach 305,208.